Island Paradise: Historic Cottage, Waterfalls, Great Swimming! Enjoy your own private island get away! This 1.8 acre island in the middle of the Ossipee River is your's for a week or the entire summer. Drive across the sturdy cement bridge and feel your cares slip away. You can fish for Bass, kayak or canoe up to the Parsonsfield/Porter Covered Bridge, walk to the local donut shop or ice cream hut or attend an auction in the village of Kezar Falls. This historic c. 1924 John Calvin Stevens cottage has original doors, woodwork and stained glass. Built for the local mill owner's family as a getaway, it still has a lot to offer. There are sweeping cathedral ceilings, a fireplace for ambiance and a wood cookstove in the kitchen. Have morning coffee in the cozy breakfast room overlooking the waterfalls. The modern kitchen has a microwave, coffee maker and all the dishes, pots and pans you will need. The large bath room has a separate tub and shower. There's one queen bed, one double bed, a sofa bed for 2, plus a blow up bed for company if you need it. Bring your own linens and towels or use ours; there's a laundromat close by. Relax in the rockers for Happy Hour on the large screened porch or have a nightly campfire at the outside fireplace, fire wood provided. You may pick the tomatoes out front if they are ripe. You can fish, swim and boat in the clean Ossipee River. And it is actually warm as it comes from Ossipee Lake! Bring your own kyack or use ours. On the north side of the island the sound of the waterfalls will lull you to sleep! On the south side you may see almost perfect reflections in the water although it does have a gentle current. Use our inner tubes and just float for hours, and the village church bells may wake you every morning. There is no beach or shallow entry for very young children. There is very little TV reception so we over 200 DVDs and VCR tapes, I hope you like the oldies. We also have cards, puzzles and board games and an assortment of books. Outside is badminton or horse shoes. Enjoy a church supper nearby. Drive 4 miles to Cornish to visit 12 Antique shops. Fine dining are close by in picturesque Cornish village. The White Mountains and major outlet shopping in North Conway are 30 minutes away. Ocean beaches and Portland, Maine's largest city, are a 50 minute drive. LL Beans in Freeport is an hours drive. Come visit our island paradise! You'll want to return. We are both local real estate brokers specializing in antique homes and homes with character. Jim also has a handyman business so he has done most of the repairs to this cottage. He took off 6 layers of linoleum and plywood to get back to the orignal wood floors in the kitchen. He took a small storage closet and added 2 large windows to create a breakfast room with a view of the waterfalls. We went to local auctions and found some antique furniture for this special cottage. We have really enjoyed our work weekends here and the more we were here the more we decided to keep and enjoy this property for a long time. I grew up in this village of Kezar Falls and used to ride my bike to this island for weekly Girl Scout meetings on the large front porch. My family now lives nearby in Cornish so it is a chance to reconnect with them. We also had a get together for my 45th high school class reunion here and had 35 visitors comfortably for a great evening of reminiscing. We even strung Christmas twinkle lights on the bridge railings. In the fall on a warm sunny October day we gave a suprise 60th Anniversary brunch for my mother and father and all their friends. It was alot of fun. This cottage was on a house tour as a fund raiser for the local historical society and we got great reviews!! We enjoy the peace and quiet...privacy and relaxation...warm water to swim in, fresh tomatoes at the door and a delightful place to entertain. At the end of the season we ended up with five bottles each of mustard and rellish because of all the friends who came for a cookout and brought things! The quiet, the privacy, the underlying hum of the waterfalls...a unique vacation!!! Island is surrounded by water. One bedroom, bathroom and the TV room have electric heat. We also installed a heat pump for heat and air conditioning. There is a wood stove for heat in the living area and a wood cook stove in the kitchen. There are only 2 channels available. The TV has an HDMI slot. We have over 200 DVDs and VCR tapes. There is a combination DVD/VCR machines. A lot of the media is dated. There are 2 kayaks available and a canoe. There are mountain bikes to ride around town or where ever. There is a small but nice golf course about 10 miles away. smoking outside only, smoking is not allowed on the screen porch! This is a private island in the middle of a river. There is a bridge to the island. The local mill owner had a canal build to power his mill. This created an island and in 1924 had this cottage built as a get away. His daughter also taught piano and was a local girl scout leader. They had meetings at the cottage. Our family had a lovely time in this interesting, historic house. We loved swimming and paddling the Ossipee river. We appreciated the AC, since the first half of the week was unusually hot for Maine. Games and puzzles on the screened in porch, naps and novels on the couches--we had a great time! There was a little more traffic noise than we had anticipated, but the sound of the river was soothing and masked most of the car noise. Thanks for the wonderful stay! Plenty of room to play yard games and let the dogs run to their hearts content. We spent our nights on the lovely screened porch and played board games. It was very relaxing, just what a vacation should be! Linda and Jim are very nice and informative. We didn't lack for anything but if we had they were just a phone call away. We stayed here for a week in July. We have two daughters 8 and 10. We loved this house. The stained glass windows were beautiful at all times of the day with different light patters coming through. The Island is gorgous and fun to explore. We fished and boated down the river. It is hard to find an easy place to swim for the kids but we did manage to get into the water which was nice and warm. The house itself has everything you need for cooking. We loved our time here. We had a wonderful stay at the john Calvin Stevens home at kezar falls. The only issue we had were the mosquitoes. Myself being in the construction business, can offer a solution to 90 % of the problem. The stagnant water behind the house next to the river must be routed into the river to keep the water moving. Stagnant water is a breeding ground for mosquitoes. Other than that,we had no other issues and enjoyed our stay. Thank you for the great suggestion and we will take care of the stagnant water issue this weekend. Linda and Jim. We enjoyed this property very much! Plenty of room and everything needed for a week with 3 young boys. We canoed, kayaked, swam, fished and explored to our hearts content. While it was a bit off the beaten tourist path -we were able to visit many fun Maine sights like Sebago Lake, beaches, the White Mountains and more. We even went horse back riding! Having the island to ourselves was a real treat! Thank you for a great summer vacation! 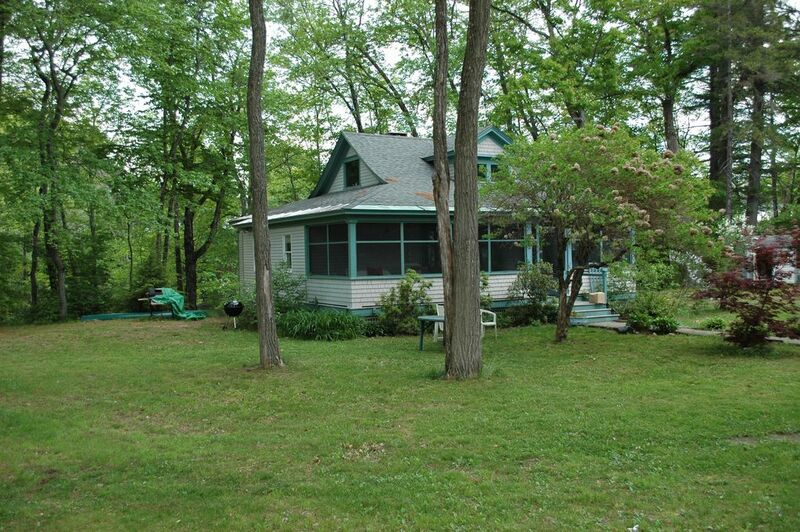 A 1924 bungalow filled with both antiques and comfortable nooks and corners for reading, napping, creating art. Nice little town. The bakery is amazing! And great sandwiches and pizzas from the Village Variety. We very much enjoyed this island paradise for a month. Borrow our inner tubes and drive up to the covered bridge and float down the river. Excellent fishing and swimming in the river.